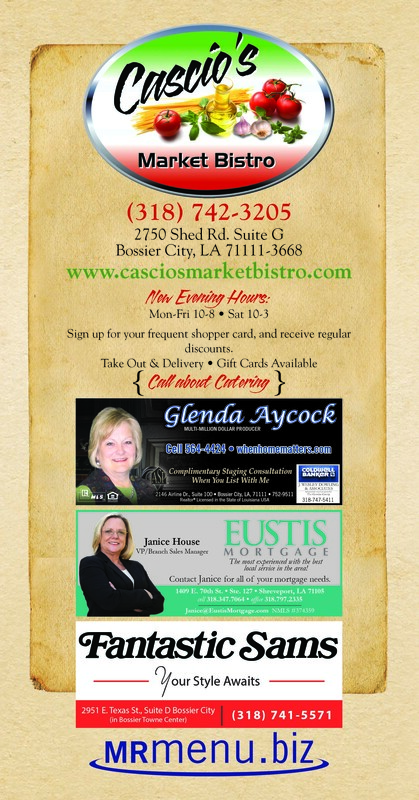 Cascio’s Market Bistro blends Louisiana flavors and Italian classics to create a unique, delicious dining experience. Located on Shed Road, just off of Airline Drive, Cascio’s menu features bistro favorites like their panini sandwiches, premium burgers, and soups and salads. They also offer a variety of entrees – from Louisiana fare like red beans and rice, chicken spaghetti, and muffalettas, to Italian dishes like pizza and pasta with homemade sausage and house marinara sauce. 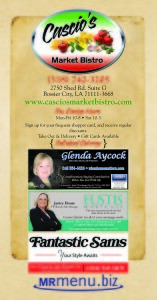 Cascio’s is also known for their in-house market, where you’ll find their homemade Italian sausage, their entrees and desserts packaged to go, Boar’s Head meats, steaks, cajun tidbits, and more. They also provide catering and special event services, guaranteed to give your event the flavor and fun you’re looking for. Stop by Cascio’s to try their famous Pizzaletta, and let us know what you think!